Rain is continuing to pour down on us here in The Gap (Brisbane North) and while the gutters resemble little rivers at the moment, things aren’t too bad. Elsewhere in Brisbane, things aren’t so great. For those who have been “praying for rain” in this area, you can stop now, we’ve had more than enough! 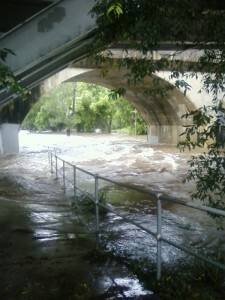 The following is a photo of the cycleway/footpath underneath Walton Bridge. 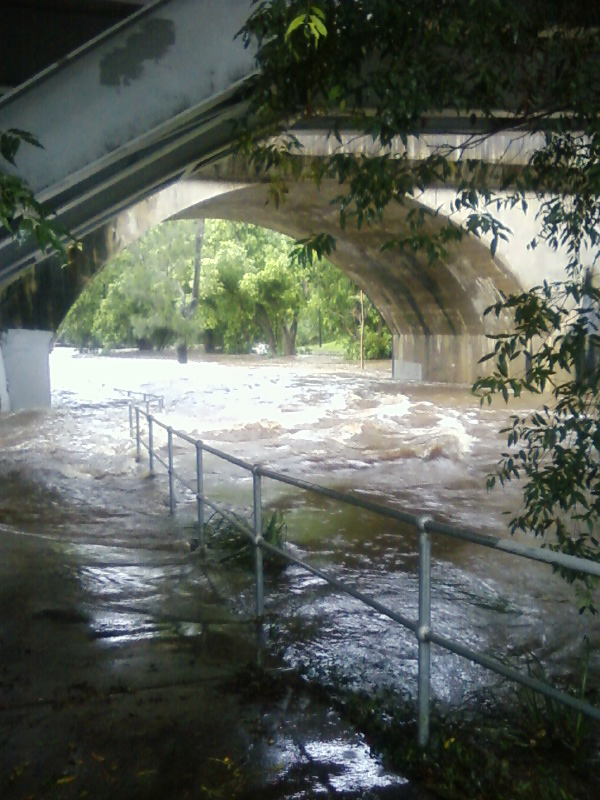 Enoggera Creek is flowing well. Given the emergency situation in the SE QLD region I have the station operational at my home QTH in The Gap (Locator QG62LN35CA). It has been a while, but I can safely say I have returned. Not sure what the next step is… looking for paid employment I guess, but I have passed all subjects this semester, which should mean that I am now qualified in IT and Electrical Engineering as a graduate. After the last exam, I could not run out of the building fast enough. 6.5 years of studies has certainly taken its toll on my mental state. Anyway… I wound up traveling northern and central NSW with my father and his girlfriend for the last fortnight — got back home yesterday. I am currently putting together some photos, and I’ll have a slide show ready for the next BOSQ meeting. I’ll put a link up to the photos when they’re done processing (the aging PIII 550MHz webserver here takes a while to resize over 500 photos, most 10Mpixel in size). We explored a number of walking tracks at Mt. Kaputar, Dorrigo and Brooms Head. Did some sight seeing at Port Macquarie and Coonabarabran. HanoiCalc got a bit of work done — it works now. Setting up the annex and awning on a hard-floor camper trailer for an overnight stay is a pain in the bum. My camp stretcher doesn’t fit in the camper itself, and only barely fits in the annex. Just because a road is marked on a GPS or paper based map, does not mean that it is in drivable condition, nor does it necessarily mean the road’s actual route bares any resemblence to the marked route. My HF radio, which is normally very touchy on 10m… works fine on that band up in the higher altitudes — I suspect a temperature-related issue. What now? Well… as I say, I’ve got to find some employment somewhere. I now officially become “unemployed” according to the damn lies^W^Wstatistics. Potential employers in the Brisbane area, should contact me directly. This also means I should have some time to dedicate towards Gentoo. My last attempt at stage builds got sidetracked by a need to study and also hit technical issues (something in glibc’s build kept hard-locking boxes). Also on the agenda here is a proper port of Gentoo to the Lemote Yeeloong. The little netbook has been running well under Debian, with Gentoo sitting in a chroot environment… now that I’m no longer using the machine for daily studies, I think the time is ripe to start looking into reloading the machine. Zhang Le did a great job incorporating Lemote’s patches into a mirror of the Linux/MIPS git tree, which I’ve been using to build my kernels… 2.6.30-rc4 has been quite stable. I’ve also been looking at the ARRL handbook, with the view of upgrading my license to the Advanced level. Then I’ll be paying for a 5-year license before the ACMA/WIA decide to up the fees again. So, much to do, and a mountain of bugs in Bugzilla with my name on them… Ohh joy. Blimey… someone must’ve said something to upset the weather. We’ve survived the last 3 storms thus far. It does seem though, that nature clobbered us in The Gap, then Wednesday night, said “Ohh… I missed you Paddington… Here you go! Ohh, and you’ve been left out too Rosewood… have some rain.” These same storms washed away parts of the Brisbane->Ipswich->Rosewood rail line… which is going to make getting to work (at Laidley) rather interesting. Last night, Blackwater (Central Queensland) got clobbered by cricket-ball sized hail. On the bright side though, we have gotten rid of trees and other garden plants that we’ve been meaning to rip out for months… and our dams are getting a much-needed top-up. But for now I am watching the BOM Queensland Weather page like a hawk.